We've been hearing a lot about how Ebola is both not very contagious and, at the same time, highly infectious. Could both be true? It turns out, yes. In comparison to other communicable diseases, Ebola is not as contagious as, for instance, the measles or the mumps. While a disease like the measles can spread through the air, making its spread through a population relatively speedy, Ebola transference requires direct contact to make the jump to a new person (perhaps just one of the reasons that Ebola travels through a population on average nine times slower than the measles). When you start talking about how infectious a disease is, however, that's another story. While how contagious a virus is can be looked at as its spread through a population, how infectious a disease is comes down to how much of that virus—whether it's in the thousands of particles of simply a few —are required to transfer the virus to a new sufferer. I just want to clarify some terminology that is frequently used interchangeably. Infectiousness and contagiousness are not the same thing. 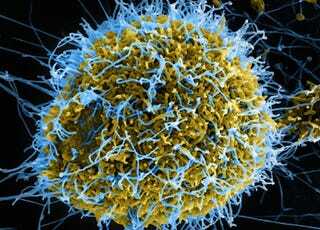 Ebola is not very contagious, but it is incredibly infectious. Contact with only a few viral particles (1-10) is adequate to produce disease. At the time of death (or at maximum viremic load) a drop of bodily fluid could have 500,000 viral particles in it. The transmissibility of those particles is how "contagious" it is. An analogy would be that you could kill yourself by drinking too much alcohol. You could drink too much beer, or you could drink too much vodka. You'd have to drink a much larger volume of beer. If beer were much easier to get than vodka this analogy would be pretty good. And if vodka, when you did find it always resulted in you attempting to drink enough to kill you. But when you came across beer there wasn't enough there to kill you... I was working on a better example with keys and door locks but I couldn't make it accurate enough. For comparison, Norovirus is 55 particles, Streptococcus is 1000, the typical E. coli that doesn't usually kill you is in the billions.